SAN DIEGO -- San Diego-based real estate investment company Presidio Residential Capital announced it handled 53 transactions totaling $331.4 million in loans, land purchases and joint ventures for the year ending Dec. 31, 2013, and plans to keep up the momentum in the coming year. The company has funded single-family projects in California, Hawaii, Texas, Idaho and Washington. In California, it has several major developments underway. 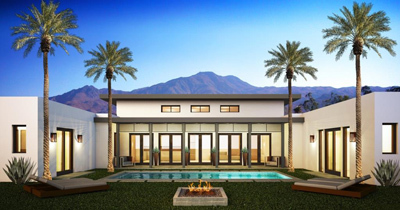 In October, Presidio announced a partnership with Alta Verde Group to build Alta Verde Coral Mountain, a $43 million community in the Coachella Valley (photo). Presidio has committed more than $38.7 million to build nine new communities comprising 638 new homes in the central coast of California. And it provided $8.2 million to build the first phase of the Golden Hill Row Home Project, an $18.8 million multifamily housing community that Fit Properties is developing in San Diego. Presidio's Alta Verde Coral Mountain. Presidio also has launched its own homebuilding company, San Joaquin Valley Homes, based in Visalia, and has committed $68.5 million to build five new communities with a total of 751 new homes in Central California. Presidio closed on two projects in early January and has more than 20 additional projects in the pipeline. “We are very excited and optimistic about the coming year, and we're off to a fast start,” Faye said. The firm provides both levered and non-levered equity and non-recourse construction financing for for-sale residential focused development opportunities. Current assets under management total more than $2 billion. (AP) -- Golden State Warriors owner Joe Lacob said the team is pushing back plans to build an arena on the San Francisco waterfront at least one year. The Warriors have faced mounting costs and opposition for an arena on a dilapidated pier near the San Francisco-Oakland Bay Bridge since they announced their intentions during an elaborate news conference on May 22, 2012. The project also might need voter approval because it exceeds current waterfront height restrictions. The Warriors played in San Francisco from 1962 to 1971 after moving from Philadelphia. The team has played across the bay in Oakland since. (AP) -- With precipitation only 15 percent of average this season, Klamath County commissioners declared a drought Tuesday for the second year in a row. The county declaration is the first step toward setting up government aid for farmers and ranchers. Last year's drought led to irrigation shutoffs for cattle ranchers in the upper basin, after the Klamath Tribes decided to exercise newly awarded senior water rights to protect fish on former reservation lands. National wildlife refuges in the region were also short of water. Farmers on the federal irrigation project straddling the Oregon-California border south of Klamath Falls are bracing for water shortages this summer. Klamath Falls has had only 1.05 inches of precipitation since Sept. 1, compared with an average of 7.04 inches, National Weather Service meteorologist Ryan Sandler said. George Buckingham, the county's emergency management director, told commissioners that snowpack for the Klamath Basin was just 19 percent of normal as of Jan. 1, compared with 108 percent of normal at this point a year ago. (AP) -- JPMorgan Chase has agreed to pay $614 million to settle a New York lawsuit over its mortgage lending practices. Federal authorities in Manhattan say the company accepted responsibility for improperly approving thousands of residential home mortgage loans for government insurance and refinancing. They say the company also has agreed to reform practices after routinely breaking rules in federally funded programs since January 2002. The government says the bank approved thousands of loans for government insurance or refinancing that didn't meet requirements of federal programs. And it said JPMorgan (NYSE: JPM) failed to self-report hundreds of loans it identified as having been affected by fraud or other deficiencies. (AP) -- Aiming to help rural communities deal with climate change, the Obama administration is creating seven regional “climate hubs” that will serve as clearinghouses for information and outreach about extreme weather across the United States. Based at existing Agriculture Department facilities, the hubs aim to help farmers and rural communities fight climate change and adapt to weather changes. The hubs will assess local climate risks, such as drought and wildfire, then develop plans for dealing with them, such as improved irrigation techniques. The seven regional hubs will be housed in forest service stations or government research labs in Ames, Iowa; Durham, N.H.; Raleigh, N.C.; Fort Collins, Colo.; El Reno, Okla.; Corvallis, Ore.; and Las Cruces, N.M.
Three smaller, additional “sub-hubs” will be created in Houghton, Mich.; Davis, Calif.; and Rio Piedras, Puerto Rico. (AP) -- The federal government is delaying its decision on whether to protect wolverines under the Endangered Species Act. The government was expected to rule by Tuesday on whether the animals are threatened and deserve additional protections. Instead, the U.S. Fish and Wildlife Service announced it would make that decision by Aug. 4. The delay would allow it to examine disputed science about how climate change will affect the wolverine's snow-covered habitat, the agency said. The delay comes after Western states asked to slow down the listing process. Fewer than 300 wolverines are believed to inhabit the lower 48 states. They have been found in remote locations from Washington state to Colorado. (AP) -- The Detroit City Council has voted 6-3 to approve transferring vacant city-owned parcels for a new hockey arena and a 45-block entertainment complex just north of downtown. Once complete, the 18,000-seat arena will become home to the Detroit Red Wings who will move out of aging Joe Louis Arena. The transfer approved Tuesday is the third part of council action on the $650 million project. In December, the board OK'd financing for the project and broadened the boundaries of the city's Downtown Development Authority. The authority would own the arena and event center. Olympia Development would have exclusive rights to use, manage and operate it, and hold naming rights. The Ilitch family owns Olympia Development and the Red Wings. (Bloomberg) -- Radian Group Inc. and Genworth Financial Inc. rallied in New York trading after posting profits from insuring U.S. mortgages. Richmond, Va.-based Genworth (NYSE: GNW), which also offers life insurance and long-term care coverage, had a $6 million operating profit at its U.S. mortgage insurer in the fourth quarter, compared with a loss a year earlier. Philadelphia-based Radian (NYSE: RDN) Wednesday reported net income of $36.4 million, after a $177.3 million loss in the last three months of 2012. Mortgage insurers cover losses when homeowners default and foreclosures fail to recoup costs. The firms are rebounding after posting years of losses when home prices tumbled in the financial crisis. Rising rates for home loans have reduced the number of borrowers refinancing their mortgages, McInerney said. That's been cushioned by higher profits from backing mortgages used to purchase homes. (Bloomberg) -- Bank of America Corp.'s $8.5 billion settlement with mortgage bond investors will be delayed almost two weeks after American International Group Inc. and other objectors asked a judge for a hearing to address loan modifications excluded from the accord. New York State Supreme Court Justice Barbara Kapnick in Manhattan on Jan. 31 approved most of the bank's 2011 deal to end claims by investors in more than 500 mortgage-security trusts that the loans backing the bonds didn’t meet promised quality. Kapnick refused to include claims BofA (NYSE: BAC) was required to repurchase modified loans, saying the trustee, Bank of New York Mellon Corp. (NYSE: BK), failed to properly evaluate them. The objectors Tuesday asked Justice Saliann Scarpulla, who took the case when Kapnick moved to an appeals court, to delay the Feb. 7 entry of the ruling. They argued the modified-loan claims are a “significant piece” of the settlement and that the ruling leaves open questions as to how much of the settlement funds will go to the trusts, which trusts are covered by the accord, and how the funds will be divided. (Bloomberg) -- Canadian building permits fell for a second month in December as multiple-unit housing projects dropped to the lowest level in nine months. The value of municipal permits fell 4.1 percent to C$6.48 billion ($5.86 billion), following a 6.6 percent decline in November, Statistics Canada said Wednesday in Ottawa. Residential permits fell 9.3 percent to C$3.70 billion as projects such as apartments and condominiums plunged 21.9 percent to C$1.47 billion. Single-family home permits posted a 1.5 percent increase to C$2.23 billion. Permits for non-residential construction rose 3.7 percent to C$2.78 billion in December. Institutional projects such as hospitals more than doubled to C$939 million, while industrial permits rose 34.9 percent to C$576 million. Commercial projects such as offices dropped 33.5 percent to C$1.26 billion. Building permits for all of 2013 totaled C$80.8 billion, down 0.1 percent from 2012, Statistics Canada said, with both residential and non-residential projects little changed. (AP) -- Work on the ambitious Panama Canal expansion project has halted after talks broke down on how to settle a dispute over $1.6 billion in cost overruns. The Spanish-led construction consortium leading the expansion says negotiations have broken down for how to finance the cost overrun. Spanish firm Sacyr SA said 10,000 jobs are at risk. Italy's Impreglio SpA construction firm is also in the consortium. The consortium and the Panama Canal Authority blame each other for the overruns. (Bloomberg) -- The Toronto real estate market is showing signs of cooling to start the year, as January sales dropped 2.2 percent to the lowest for that month since 2009. Home sales in the nation's largest housing market fell to 4,135 units from 4,229 units a year earlier, the Toronto Real Estate Board said Wednesday, citing a 17 percent drop in new listings. Average sales prices in the city rose 9.2 percent to C$526,528 ($475,000), the board said. Canada's housing market has been slowing. National existing home resales dropped for three consecutive months to end 2013, fueling expectations that real estate has ceased to be a catalyst for economic growth. The total value of purchases in six major Canadian real estate markets rose 19 percent to C$5.09 billion in January compared with the same month a year earlier, and the number of homes sold rose 7.3 percent, according to data compiled by Bloomberg News from regional real estate boards. In both cases, that's less than half the annual pace in December. (Bloomberg) -- London luxury home rents rose for the first time in 21 months in January after companies relocated senior employees to the U.K. capital from overseas, Knight Frank LLP said. Average rents for houses and apartments in the city's most expensive neighborhoods climbed 0.2 percent from December, the first monthly increase since April 2012, an index published Wednesday by the broker showed. Permanent-staff vacancies in London during December rose by the most since January 2001, according to a report by Markit Economics. That helped the number of rentals gain 19 percent during the 12 months to January, Knight Frank said. Luxury rents were 2 percent lower than a year earlier. Knight Frank expects annual growth to return by the end of this year. (Bloomberg) -- Mitsubishi Estate Co., Japan's biggest developer by market value, said nine-month net income rose 73 percent as profit margins of its residential business improved. Net income gained to 58.5 billion yen ($577 million) for the nine months ended Dec. 31 from 33.9 billion yen a year ago, the Tokyo-based company said Wednesday. Sales rose 10 percent to 720.3 billion yen. Profit for its residential business gained 37 percent to 8.3 billion yen during the period from a year ago ahead of the government's plan to increase sales tax to 8 percent. Mitsubishi Estate's commercial development business more than doubled its profit after selling some assets, it said.